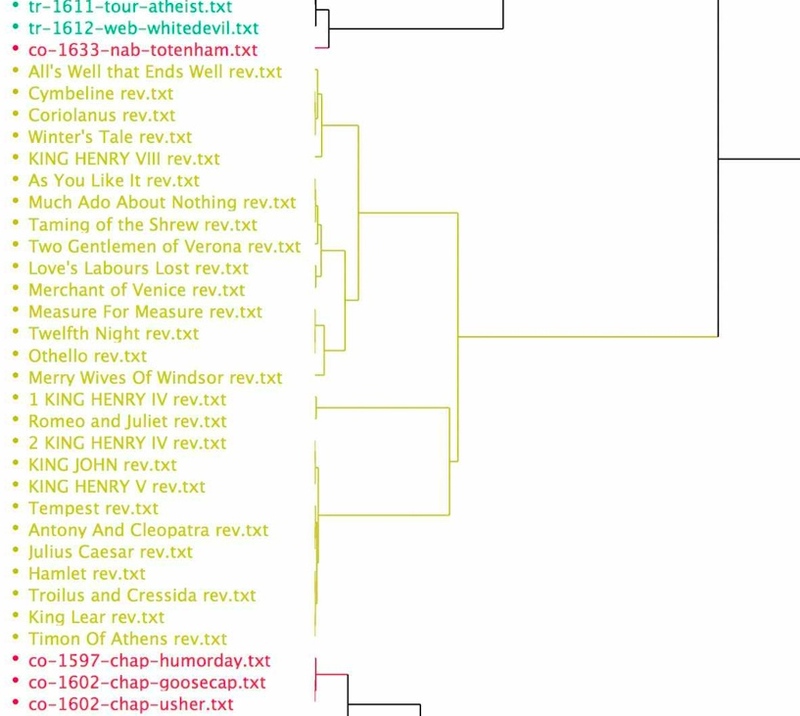 When Jonathan Hope and I did our initial Docuscope study of over 300 Renaissance plays, we found Shakespeare’s plays clustering together for the most part. One explanation for this clustering was that it was caused by something distinctive in Shakespeare’s writing, and that this authorial signature becomes visible in the same way genre does—at the level of the sentence. Indeed, in our first approach to this larger dataset (one we’d assembled from the Globe Shakespeare and Martin Mueller’s semi-algorithmically modernized TCP plays), we thought that authorship was overriding genre as source of patterned variance. But everything which goes into the dataset also comes out. And in this case, it was editorial difference that was helping to isolate Shakespeare’s plays. When we did a further study of the clusters containing works by Shakespeare, we noticed that their elevated levels of two different LATs that dealt with punctuation – TimeDate and LanguageReference – was an artifact of hand modernization. 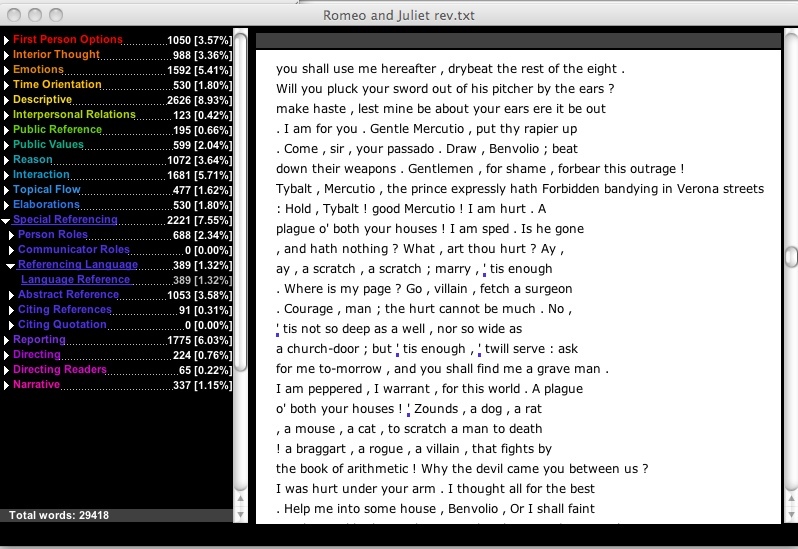 So, the punctuation was a tip off, increasing the chances that Shakespeare’s plays would cluster together. We now have the ability to skip or blacklist certain word strings, thanks to a newly updated version of Docuscope created by Suguru Ishizaki. At some point, we will open this can of worms–actually modifying Docuscope’s original tagging protocols–but not yet. There is still more to be learned from the results from an unmodified Docuscope: when we don’t touch the contents of its internal dictionaries, we have the ability to compare results across periods or corpora. In this case, we learn that Docuscope is sensitive to human editorial intervention in texts. So sensitive, in fact, that it produced an almost complete clustering of Shakespeare’s plays in the larger group of 320 that we profiled in the online draft of our “Hundredth Psalm” article. Now we see that plays by Munday, Heywood, Marlowe, Shirley, Rowley, Webster, Middleton, and Massinger are showing greater similarities with Shakespeare: the variability of their punctuation is not being used against them. Within the Shakespeare plays that do cluster together, we see some of the same similarities–Coriolanus with Cymbeline, for example. But the terms on which Shakespeare’s plays are related to each other are now more limited–we have eliminated two categories of LATs that may have been sorting Shakespeare’s plays with respect to each other. This relative loss of sorting power within Shakespeare’s works seems tolerable to us, however, because it allows for a more meaningful portrait of Shakespeare’s relationship to other dramatists of the period. What excited us about this large diagram was that it says something about 150 years of early modern drama as a whole, inasmuch as that whole could be represented by over 300 works. 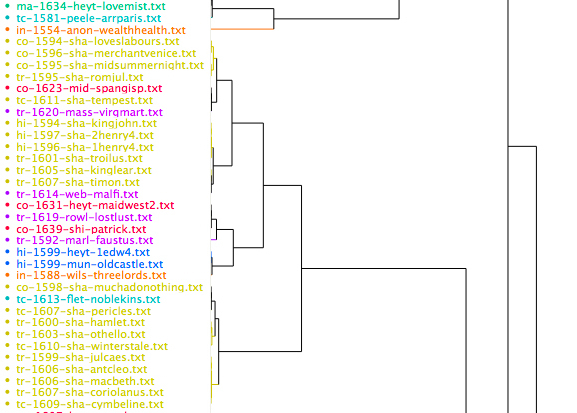 This entry was posted in Shakespeare and tagged dendrograms, editing, punctuation, Shakespeare. Bookmark the permalink. Comments are closed, but you can leave a trackback: Trackback URL.